4.1 out of 5 based on 200 bloggers and 81 commenters. 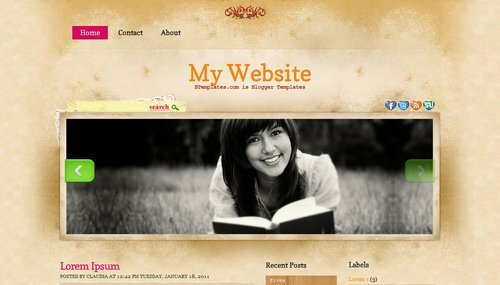 My Website is a free premium blogger template with 3 columns, right sidebar, grunge style, an exclusive design for Blogger, footer columns, slider, girly looking and vintage style. Excellent template for blogs about books or crafts. is it somehow possible to add several sideshows from different albums to autoplay one after another? thanks, btw its a great template love it. i forgot 1 more thing to ask, do you also have small icons for reddit/g+ etc ? ..
sorry for being a little demanding, i’m a first time blogger and mainly to practice my english skills and keeping my family back in germany up to date. Instead of having the two sidebars on the right side, can I have one side on each side of the post? I tried going to the Layout section and it will not allow me to, so I assume I have to do it through HTML. Can you tell me what I need to rearrange to get this working? Thanks so much! Hi! Thanks for the beautiful template! I really appreciate all the time you put into it. 1) How do I remove the search? how did you get your pictures to work on your slider? i have a similar problem, either the pics turn out really small or way too big. but i put in the right dimensions. i have tried photobucket and picasa. thanks! @FreeSpirit: This helped me so much, thank you! When I loaded this xml onto my site the share buttons are hidden. If you hover over them their titles show up, but otherwise there is just a large gap. Does anyone know how to make these visible? i Want to remove 1sidebar from all the pages?? ?/any solution?? Does ANYONE know how to personalize the facebook and twitter buttons? I can’t find a url anywhere in the html. HELP! I’m in the process of changing the images in the slider, but having a bit of trouble. I am re-sizing my photos to 927 x 291 pixels, but the image is always left-justified and smaller than the frame. Any suggestions? hey, Im wondering if you could help me out…I dont know how to change the images in the Slider for this template, im a new blogger and I dont know what too do.. could you please help me ? Ho anch’io lo stesso problema di Melanie: non riesco ad eliminare il tasto di “SEARCH”, quello sopra lo slideshow in alto a sinistra. Grazie per l’aiuto che mi darete. I have no problem in showing photos on my blog, but I want all the photos to slide repeatedly from the top. Could anyone please help me? Thanks for this beautiful template. There is one hitch : How to get the slide to loop? I’ve just uploaded this template, have my sliders in place, and am now working on the other items. How do you change the landing pages for the little Facebook, Twitter, Stumbleupon Hearts? Do you happen to have a pinterest and instagram heart button? i’ve tried to upload the pictures through picasa and photobucket, but still, when I copied the url, it didn’t work. The photoes were broken. what’s wrong? I use it for my experimental site…. How can I transfer the old files to my own server so this won’t happen again. This template is broken!!! Looks like the background images are no longer hosted and since the template has removed the ability to use bloggers template designer to replace the background it useless! I’ll be searching for a replacement especially since the slideshow is also not working. The slider in this template is not working. Few months back, it worked very well. But now the slider is not working. I like this template very much. So i don’t want to change it. So please update this template by replacing the broken url’s. on the search for sch information.